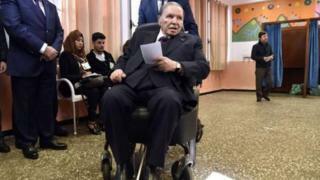 Algeria President Abdelaziz Bouteflika fit resign on 28 April according to local tori pipo. Di president go take "steps to ensure state institutions continue to function during di transition period... [di] resignation fit happun before April 28, 2019", according to statement from im office dat na wetin AFP news agency dey report. Protests break out for February afta di 82-year-old, wey don dey office for 20 years announce im plans to run for fifth term for office. Im neva too show face for public since im get stroke for 2013. Because of all di pressure and protest for di kontri, im tok say im no go seek re-election. Im also shift di elections dem but im no give new date, many pipo vex say im dey try extend im time for office. For weekend oga Bouteflika announce major change for im cabinet.